Hall of the Mountain King: Review: Iced Earth, "Plagues of Babylon"
Barlow returned in the middle of a two-album concept based on the ideas from their classic Something Wicked This Way Comes record. The concept didn’t live up to what I’d expected, and the split with Owens on the first volume and Barlow on the second kind of spoiled the continuity of the project to my ears. I finally had these promised albums that we’d waited years on, and to be honest, they were disappointing. I rarely return to them. In 2011, Barlow left the band again, and singer Stu Block, who I quite liked with Canadian progressive thrashers Into Eternity, took over vocal duties. The result was the mediocre Dystopia, which despite having one of the best songs that Schaffer has recorded in years in the semi-ballad “Anthem,” seemed uninspired and a bit boring. Block’s vocals, at times, carried heavy unnatural effects, and he sounded as though he were uncomfortable in the role. Far too often, he seemed to be imitating Barlow. That brings us to Plagues of Babylon, and at least one of the issues of Dystopia has been resolved: Block sounds much better, much more natural and much more confident on this record. That’s the good news. The bad news is that Schaffer has written another collection of mediocre and uninspired songs for him to sing. 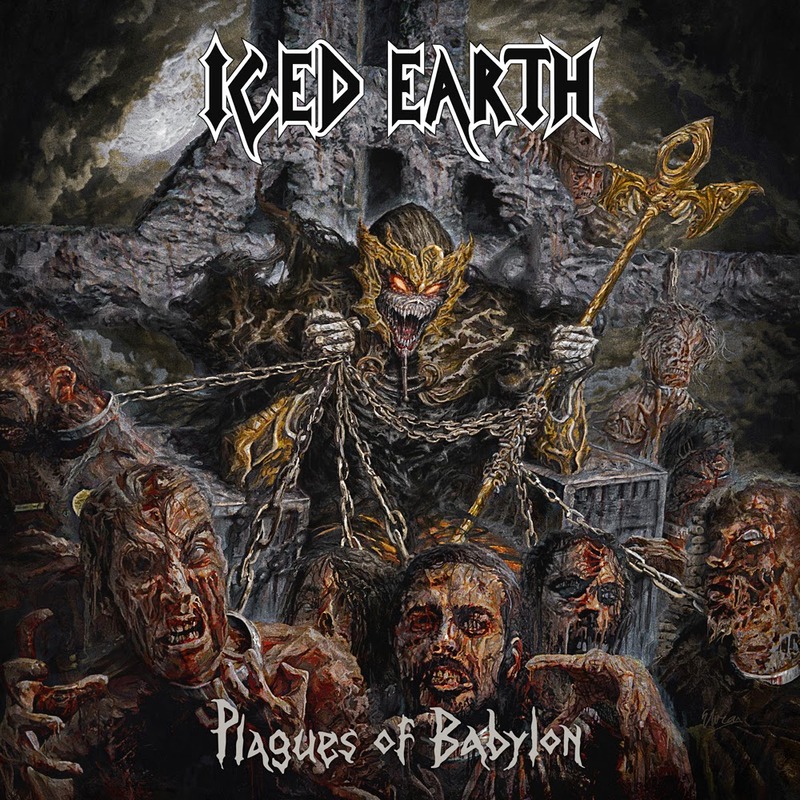 The overwhelming feeling that I get from most of Plagues of Babylon is that I’ve heard these songs from Iced Earth before and done much better. There are the great, tight guitar riffs I expect and cool bits and pieces scattered throughout the record, but they rarely come together the way they used to. Block has some strong moments. But where are the hooks? They’re, for the most part, missing. There’s not a lot in these songs to grab on to, not a lot that pulls you in. The album is not without its moments. One of those is an odd choice of covers in “Highwayman” from the Highwaymen. In this version Schaffer, Block, Russell Allen of Symphony X and Michael Poulsen of Volbeat stand in for country legends Johnny Cash, Waylon Jennings, Willie Nelson and Kris Kristofferson. The tune sticks pretty faithfully to the melody of the original, with a whole lot more crunch. Schaffer’s vocals on the opening verse are, not surprisingly, the weakest of the bunch, while Allen’s on the second are the strongest. Poulsen, whose band has more than a little country in its sound, seems to fit the song better than any of the others. I wonder what it might have sounded like if Blind Guardian’s Hansi Kursch, who appears on other tunes, had taken a turn instead of Schaffer. Among the original tracks on the record, the most interesting may be “Peacemaker.” The Southern rock-influenced intro and verse is the most original moment on the record, and Block’s voice works surprisingly well with the western theme. When the song goes heavier, it has more of a classic hard rock feel. It’s different, and I really dig it. For me, it’s the clear winner on Plagues of Babylon. For one thing, I think the Something Wicked concept has run its course, and Schaffer needs to let it go. The first six songs on this record, once again, play into that storyline, and they have the same problems that his other forays back into that world have had. They’re more driven by story than song, and there’s a certain sound he’s looking for that kind of makes them sound all the same. The songs that come after the Something Wicked tunes are far more interesting. “Parasite,” like “Peacemaker” brings in more of a hard rock feel. 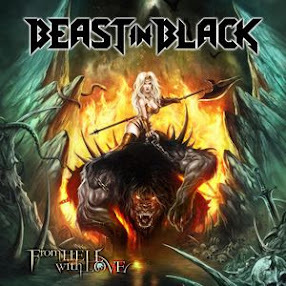 “Spirit of the Times” is a strong Iced Earth ballad, though it does sound somewhat familiar, and it features a slightly different vocal performance from Block that I like. Of the Something Wicked tunes, “Among the Living Dead” is probably the strongest. Though Kursch appears on several songs, that’s the one where you can really hear his work. “Resistance” also has a nice change of pace on the verse, but the chorus is a little vanilla. I don’t dislike Plagues of Babylon. “Anthem” notwithstanding, I think it’s a far better record than Dystopia. Neither, though, do I find it compelling in any way. I really do believe that there’s music left in Iced Earth to rival some of their best work. You can hear it on some of the later tunes here, but I believe that Schaffer needs to concentrate more on writing good songs than stories and concepts. As with their last few records, I’m left with a handful of songs I’ll take away from this one and many more that I’ll forget about.